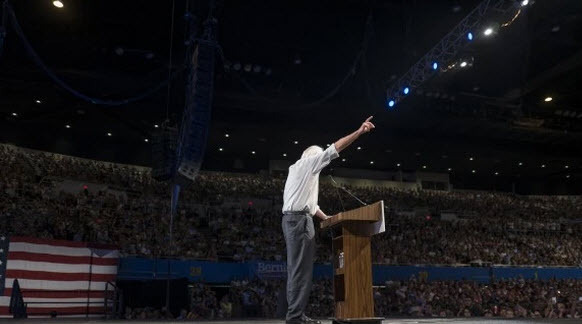 Home » News » Latest News » 100,000 people have come to recent Bernie Sanders rallies. How does he do it? Bernie, of course, is Bernie Sanders, the senator from Vermont whose Democratic presidential campaign has brought more than 100,000 people to his rallies in recent weeks — making him the biggest draw on the campaign trail this year. LOS ANGELES — Dante Harris, the leader of a local flight attendants union, had a question for the 17,500 people inside the Los Angeles Sports Arena. Bernie, of course, is Bernie Sanders, the senator from Vermont whose Democratic presidential campaign has brought more than 100,000 people to his rallies in recent weeks — making him the biggest draw on the campaign trail this year. The huge crowds are building via social media, word of mouth and promotion by like-minded local groups in each city that Sanders visits, without any paid advertising by the campaign. Such turnout is no guarantee that Sanders will perform well in the crucial early nominating states — fellow Vermonter Howard Dean preached to similarly large and frenzied audiences in mostly liberal enclaves in 2003, only to collapse as the Iowa caucuses approached. But it is drawing energy and attention away from Democratic front-runner Hillary Rodham Clinton, whose largest crowd to date was 5,500, according to her campaign. And it is creating a network of small-scale donors and volunteers that could provide Sanders with the resources he will need to compete with Clinton in the weeks and months ahead. Roughly 28,000 showed up to see Sanders on Sunday in Portland, Ore., the largest crowd of the 2016 presidential campaign cycle. He drew 15,000 in Seattle on Saturday. Approximately 11,000 were in Phoenix recently; 10,000 in Madison, Wis.; 8,000 in Dallas; and 4,500 in New Orleans. On Monday night, Sanders’s campaign said that 27,500 people were inside and outside the sports arena — a figure impossible to independently verify. But nearly every seat in the building appeared to be taken, and the arena floor was packed. Outside, thousands more watched on large screens. The crowd was noticeably more diverse than those at recent Sanders rallies in Portland, Seattle and other majority white cities — Los Angeles is majority-minority, with about 44 percent of its population Latino. Those who came to “Feel the Bern” — a popular chant among Sanders supporters — were white, Latino, black and Asian. There were young hipsters and graying hippies. Some wore black T-shirts with red hammers and sickles, others wore black T-shirts that read, “Black Lives Matter.” They sang along as the loudspeakers blasted songs by Willie Nelson, Tracy Chapman and Neil Young. About a week before each Sanders rally, the campaign sets up a Web page advertising the location and blasts out an e-mail to supporters in that geographic area, asking them to RSVP. The events are also promoted on Facebook. And from there, things tend to take on a life of their own. “What we’re seeing all across the country are organic formations of people independent of the campaign,” said Phil Fiermonte, Sanders’s national field director. Harris got a speaking slot Monday night because his union helped promote the rally. Same with Joe Galliani, a climate-change activist and member of a local union who earned some of the loudest cheers as he denounced construction of the Keystone XL pipeline and touted the benefits of solar roofs. There was Maria Barrera, the 31-year-old leader of the Coalition for Humane Immigrant Rights of Los Angeles, who burst into tears as she noted that Congress hasn’t enacted comprehensive immigration reforms since the 1980s. Next came comedian Sarah Silverman, who earlier Monday had alerted her 6.67 million Twitter followers of her plans to attend the rally. “Bernie always seems to be on the right side of history,” Silverman said, noting that he was a civil rights activist in the 1960s, supported gay rights in the 1980s and strongly opposed the Iraq war before most other Americans. The turnout and enthusiasm has been similar at Sanders events across the country. For the Portland rally, a local group lobbying for a $15 per hour minimum wage in the city — a cause Sanders supports nationally — drove a sizable contingent of people to the event. And the Oregon Democratic Party sent an e-mail to people in its database letting them know about the rally (with the disclaimer that the party is not taking sides in the presidential primary). Sanders supporters also posted fliers on telephone poles and promoted the event by “chalking the sidewalks,” a tradition in a city whose residents are known to turn out in big numbers for political rallies. In May 2008, an estimated 75,000 people came to see then-Sen. Barack Obama on the banks of the Willamette River as he campaigned for the Democratic presidential nomination. Sanders is striving to harness the energy of his rallies to help him in states such as Iowa and New Hampshire, where his crowds have been much smaller but still relatively robust. Volunteers hand out donation envelopes to rally attendees and carefully take down their contact information so they can be solicited for money later. On Monday night, anyone who gave on the spot received a Sanders campaign T-shirt. Speakers on stage asked the crowd to text “Bernie” to a five-digit number. In reply, they would receive text messages asking for money and volunteer time. When Sanders came onstage, the cheers were deafening. His voice hoarse, the senator told the crowd, “This campaign is not a billionaire-funded campaign — it is a people-funded campaign. “There is no president who will fight harder to end institutional racism,” he told them. “Or for a higher minimum wage. Or for paid parental leave. Or for at least two weeks of paid vacation. Or to end military conflicts overseas. Or to restore the Glass-Steagall Act. “Whenever we stand together, when we do not allow them to divide us up by the color of our skin or our sexual orientation — by whether a man or a woman is born in America or born somewhere else — whenever we stand together, there is nothing, nothing, nothing we cannot accomplish,” he said. “Bernie! Bernie! Bernie!” the crowd shouted repeatedly. Gloria Rios, from Eagle Rock, Calif., said she joined Sander’s e-mail list a month ago. “I feel very strongly about him,” she said, adding that she has concerns about Democratic front-runner Hillary Rodham Clinton. What are those concerns? She paused. For a really long time. Jean-Luc St. Pierre, 19, said he flew from Baltimore to attend the rally. He’s started a “Baltimore for Bernie” Facebook group in the hometown of former Maryland governor Martin O’Malley, another Democratic presidential candidate. St. Pierre said he doesn’t think O’Malley has any chance of gaining traction in a race in which Clinton has been the presumed front-runner for years and Sanders is drawing massive crowds. Rigoberto Chavez, a 19-year-old from Downey, Calif., said he liked Sanders’s plans for affordable college education. He recounted that as a high school senior he was assigned to do a project on a U.S. senator. He spotted the name “Bernie” on the list and chose the Vermont man with the funny name.